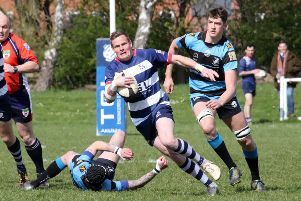 Banbury Bulls suffered rare back-to-back Wadworth6X South West One East defeats as Newbury Blues ran out 40-17 winners at the DCS Stadium. Newbury look firm favourites to go straight back up and, on this showing, look the team to catch at this stage. Despite Bulls taking an early lead, the visitors got on top and, once they got their noses in front, there was no way back for Matt Goode’s side which was missing several key players through injury. Added to that list now is Dan Kirwin who suffered a nasty wrist injury in the closing stages and he looks set to be on the sidelines for some time. Bulls enjoyed plenty of ball in the opening stages, working it across the pitch with confidence, and they took the early lead. Ian Isham’s throw found Angus Johnson at the back of the line-out and Bulls pushed towards the line. Chris Phillips was held up but Ed Phillips kept the ball alive and found Jacob Mills who forced his way over under the posts. Phillips added the simplest of conversions to give Bulls the ideal start they needed. Newbury were pinned in their own half but found a score following a brief spell in the opposing half. Toby Pearce was tackled short of the line but Newbury recycled the ball and Kris Ford was sent over, leaving Rory Jones to add the extras. Newbury upped the tempo and only some great defence by Bulls kept out Harvey North and Jones as the visitors switched the ball along the line with Ford driving them forward. Bulls could not clear their lines and Newbury kept the pressure on, a rolling maul should have given them the lead but Dylan Stewart spilled the pass as he looked set to go over in the corner. From a line-out, Josh Winfield caught and drove for the line but was held up. Bulls were still pinned back and, following a scrum on the 22, Alex Bancroft released Josh Bartlett who raced for the corner but, with North on the overlap, he took too long grounding the ball. Bulls had a let-off but finally fell behind when more Newbury pressure resulted in a penalty try. The powerful Ford, who cut his teeth in Rugby League with Oxford, continued to carry deep into the Banbury territory as Newbury turned the screw and it came as no surprise when they increased their advantage. Ford created the opening for North who went over in the corner and Jones kicked a difficult conversion from out wide. Bulls were starved of the ball and had to work hard to keep Newbury from adding to their tally before halftime but they still had a healthy 21-10 lead. The interval came at the right time and after the restart Bulls began to enjoy more of the ball again. Twice they went close in the corner before the ball was switched from left to right and Chris Phillips forced his way over with Ed Phillips adding the extras. But Newbury soon regained control and good work down the left saw North find Winfield who cantered over before grounding behind the posts and Jones added the extras. Newbury pulled away from Bulls moments later when Jones released North on the left and he sprinted clear before grounding behind the posts. Jones kicked the conversion to give Newbury a 35-17 lead. More pressure resulted in a simple try for Jones, from which his conversion hit the upright, as Newbury raced away in the second half. With Newbury camped in the Bulls’ half in the second period, it was now case of damage limitation for Goode’s side. But Bulls enjoyed some good ball in the closing stages and went close to getting another score. It so nearly arrived when Kirwin intercepted and raced for the line only to be high-tackled by North, who got a yellow card.